RSVP via Facebook and/or Eventbrite! Shop "The Pink Parachute Project" Artwork HERE!! The parachute is the symbol of resistance. The pink dress takes the metaphor further: rising above it all, and going against the wind that tries to hold women back, they conquer it all and still move forward with their essential life-giving nature intact. This same parachute also is a symbol of safety and reassurance. It takes courage to jump, sometimes into the void. Women, standing together, become each other's pink parachute. 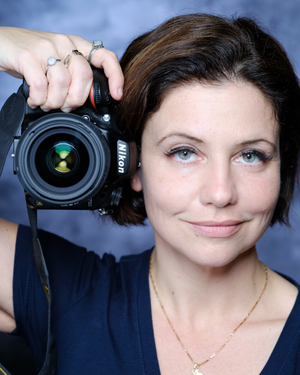 Please join Art for the People for a special night with Teodora Pogonat, photographer for our current solo exhibition, The Pink Parachute Project! Let’s Celebrate Together the Strength & Resilience of Women! 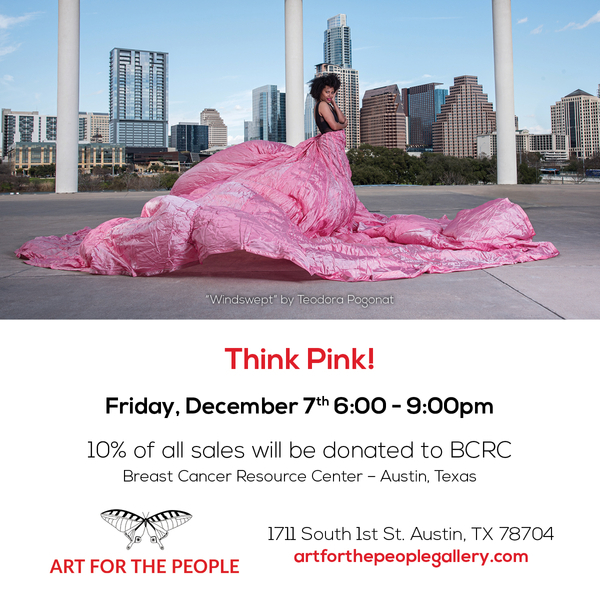 Sip on a holiday cocktail while shopping our array of items created by 100+ Austin Artists. 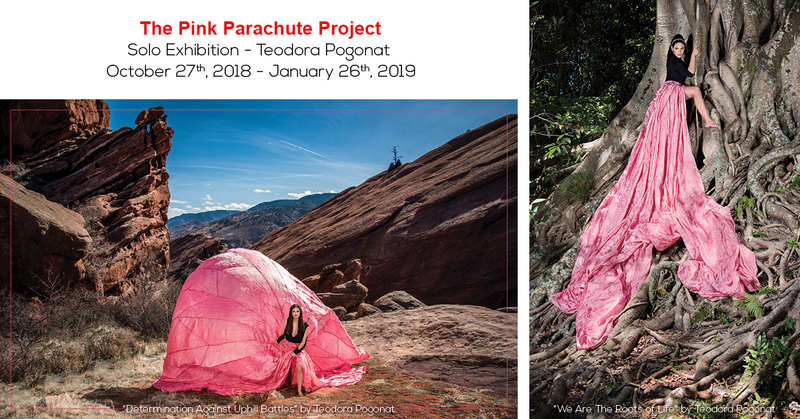 The 1960s British pink parachute that Teodora uses for The Pink Parachute Project will be at Art for the People for the event!!! Rideshare is a great way to go! We do have parking behind our building, but it fills up with people quickly! To me a parachute, represents substantial material, that which creates resistance and slows us down as we fall. In our society the color pink is assigned to the female gender. 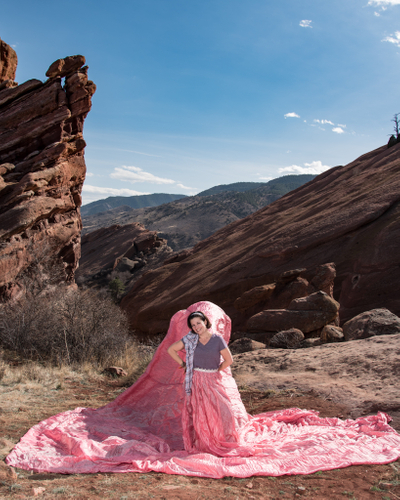 When I add parachute and pink together, immediately what comes to mind is the resistance internal and external that women face, held back based on inequality. On the other hand, I feel strongly that the pink parachute symbolizes beauty, hope, and safety. A parachute does much more than just stopping one from falling willy nilly. It shines in the light, moves in flux of the air, and gives a positive wind resistance enabling one to control their landing on safe ground, exactly where one wants to go. Beauty, grace and strength hold tight in the wind. Sometimes it feels like women are up against the entire world in an uphill battle. Women have to fight so many forces to achieve their goals and it continues throughout their lives. But youth provides stamina and powerful energy. Youth blesses us with fierce strength - enough to dominate the rough terrain and forge a path up a hill. Young women have the greatest opportunity to change their world to achieve their dreams by harnessing their gifts and using their innate strengths. The inner strength and power women possess carry them through. There is no force that can keep our future generations from achieving their goals and the equality we all deserve. The staircase in this image, reminiscent of Cinderella at midnight, and “DaVita” (meaning “For Life”) at the top, represents our climb out of forced gender stereotypes and unbreakable (as of yet) glass ceilings. Women’s equality goals are attainable and the climb never thwarted by anchors or obstacles. Do you see a path to the top and celebration? It is up to women to forge their own pathway with fortitude and cause for celebration. This piece was created to symbolize the rise above the perceptions and expectations of physical beauty that media and society pressures women. How would you judge the woman in the image if you were to be told she has a Ph.D., or if she has a G.E.D.? Would you be surprised if she has an engineering degree, is a medical doctor or a CEO? What would you think if the model used for the image were not wearing makeup and was 100lbs heavier? While these double standards can hold women back, women have the power to own their beauty and take control of the perceptions and societal definitions of physical presentation. The name of this structure is literally called “The Coral Castle” and represents “home”. The image represents the longing for equality no matter what lifestyle and career choices are made (career, family planning, stay-at-home, large family, no family, etc). Women have the power of choice and we also have the power to break free from the harsh judgements with mutual support of one another. Women supporting women is the beginning of bringing about the equality we seek from the rest of society. The image created is a reminder that as we continue to fight for gender equality women have to fight the labels that they are given. This image is meant to depict words as spears, and that we can rise above and change the narrative by challenging and changing the words that are used to describe us and our actions. "Bracing & Fighting The Wind"
As I stood in front of the vast rock formations, dwarfing us in the foreground, I could only think of the issue of double standards women have to navigate every day: our emotions, our looks, our career and family choices - basically every choice we make that defines our lives. At that moment, I wanted to create an image that defines that double-standard with the parachute pulling in two directions. Though the pull is unequal, our young lady stands undeterred pushing forward with power and strength. Women can set their eyes forward and not allow these double standards and judgements to stop them from moving forward. Women can collectively help change the tone and the narrative of the standards. This image represents how incredibly exhausting and exasperating it can be to constantly fight one battle after another, sometimes from multiple directions at the same time, and yet still maintain the strength needed to persist. Whether political policies or societal behavior hindering women’s equality, there are times when it feels like we need stop and take a breath before continuing on. With the respite, though, comes a renewed strength to continue on undeterred. This image is created to represent the grace and persistence women have to “go high” in the face of the social injustices and unequal policies that affect us politically, economically, and personally. The image is meant to depict the notion that women are often expected to ignore bad behavior, but instead we must face it and continue to fight it. Michelle Obama has said, "when they go low, we go high". The red spears representing the words that are meant to stain us. Taking the higher ground means making a conscious decision to be our higher and better selves without stooping. Standing tall with grace and persistence is an ability women have to change inequality. This image represents that women can take control and change the direction of the narrative. While women face many issues on a daily basis throughout their life (in all directions and in all aspects), women do not need to bend to the wind and allow it to direct their life. While the wind can pull us back, we can take control of the parachute and our destination by focusing on our strengths. This image represents women’s innate ability to stand strong, persist and balance it all. Like a dancer balancing on a rock, women are able to juggle anything that comes their way. The art of balancing is like ballet or ice skating. Fine and gross motor skills must all work in tandem with the desired outcome of the choreography. Every single movement has meaning and has to mesh with ones willpower to achieve that perfect harmony. It's a non-stop goal, getting to that central point of balance. While the creative series started out to symbolize the struggles that we as women face, it has also become empowering by reminding women of their strengths. This image showing a woman standing tall against the wind that tries to pull her back, symbolizes the abstract of the intertwined reality women face and the strength we find to push through gender barriers from an early age, be fierce, face uphill battles in every aspect of a woman’s life, all while expected to be graceful, nurturing yet independent, and putting on a public face despite it all. I created this image to represent that despite the wind pushing us back, we can find safety in the parachute and a place to rest. This image is meant to remind women that they can hold their goals dear to their hearts, stand their ground with grace, and forge ahead undeterred. I felt that we are at the start and forefront of a third Women’s Rights movement. The first being at the turn of the century with the right to vote, the second being in the 60’s & 70’s with the right to work, and now the third being an effort to shatter glass ceilings, change perceptions and find equality in every aspect of our lives. And success of this movement relies on women’s empowerment to persist and persevere. "Calm In The Face Of The Storm"
This image is meant to represent women’s strength in the face of adversity. A reminder that we can think through the difficulties, find our voice and band together to face the coming storm. The image is meant to represent women as a steadfast force in the face of a coming storm. While the parachute can weigh us down in a storm, it can also be seen as the anchor that provides safety. Our safety in this respect is our calm. This image is meant to represent women as a nurturing beacon of hope for future generations. I mean to symbolize that like the lighthouse, women are the guiding light in life, for society and for our family. Like the lighthouse, we bring out the best in people, nurturing them and bringing them safety. I created this image to remind women that we can be a guiding light in the lives of others and for our future generations. The lighthouse has symbolized, throughout time immortal the way forward to help in navigating our way through rough waters whether those waters be financial, emotional, business or spiritual in nature. The woman of the lighthouse speaks to us of safe harbors and security - orange and red chakra points - in the face of adversity which she's overcome. The inspiration for this image was to showcase how women are judged for their emotions, but this is also one of our strengths. We can smile and laugh it off, because the reality is that women’s emotions are one of the most powerful traits we possess. Laughter IS the best medicine. When one can truly laugh off the absurdity of all the dramas faced, especially if they appear to be of a life or death nature, the reward is laughter and nothing feels quite as good as a great belly laugh in spite of it all. "We Are The Roots of Life"
This image was created with the intention to represent women as creators, who birth humanity, ideas, relationships and the welfare of all living creatures on earth. With this power women should know that they can shape future generations. Just as the parachute can be steered within the wind that creates resistance, so too can women mold future generations to make our world a better place, one issue at a time.